A prominent businessman in eastern Iowa man could face more than $100,000 in penalties for illegally burning a large pile of trash containing asbestos. Lynn Hicks, spokesman for the Iowa Attorney General’s office, says in February of 2017 Joel Thys, of Belle Plaine, created a 20-foot tall mound of old mobile homes and brush. “On his land he had five mobile homes, he also had removed some trees, and he put them in a pile. He had been warned by the local fire chief not to burn them,” Hicks said. Thys sought permission from the city to burn the pile but was denied. According to Hicks, Thys ignored the warnings and began to burn the pile around 3 a.m. on February 20. “The result was the pile burned for several days, until March 3, and was observed by Iowa OSHA to be hot and smoldering through March 22,” Hicks said. The Iowa Attorney General’s office, on behalf of the Iowa Department of Natural Resources, has filed a lawsuit seeking civil penalties of up to $15,000 per day for violating DNR regulations on asbestos disposal and opening burning and dumping. “We know that the pile was burning at least 10 days, from February 20 to March 3, and smoldered thereafter,” Hicks said. “So, we’re talking about potential penalties in excess of $100,000.” The filing in Benton County District Court also notes, before the 2017 burn, Thys had been cited by the DNR twice before for open burning violations and once for asbestos violations. 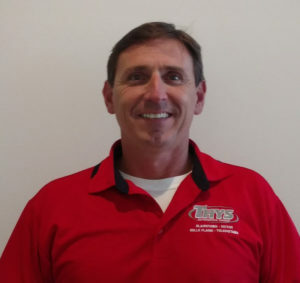 Joel Thys is the president of Thys Auto Group, which owns dealerships in Belle Plaine, Blairstown and Toledo.